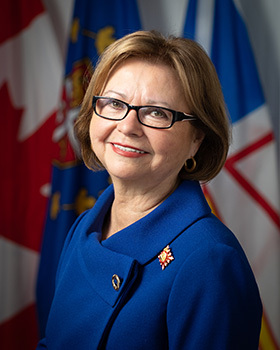 If the Lieutenant Governor is just one of a group of important dignitaries bringing greetings, the Lieutenant Governor is generally the first to speak. If in doubt, seek clarification from the Office of the Lieutenant Governor (709) 729-4738. If providing a keynote speech, the Lieutenant Governor is always the last to speak. If presenting a gift to the Lieutenant Governor during an event, please notify the Office of the Lieutenant Governor in advance. It is customary to present a gift unwrapped, so it may be easily viewed and shown to the audience without delay. As a federal public office holder, the Lieutenant Governor is unable to accept gifts of a value greater than $200. Donations of items to Government House are not bound by these rules and automatically become part of the Government House Crown collection, once accepted. At the conclusion of an event, the emcee will ask guests to rise for the departure of the Lieutenant Governor. Once the Lieutenant Governor and the Aide-de-Camp leave the room, the event can continue. On occasion, the Lieutenant Governor may re-enter the room (informally) and mingle briefly, departing at her leisure. No announcement is necessary. For plays and concerts, The emcee will ask the audience to stand when the Lieutenant Governor leaves the theatre at the end of a performance. No announcement is necessary for intermissions. Following a convocation or graduation, the Lieutenant Governor and the Aide-de-Camp will lead the procession from the platform. The departure of the Lieutenant Governor should not interfere with the continuation of an event. The Aide-de-Camp will ensure the host(s) are informed in advance of the departure of the Lieutenant Governor, so they may rejoin her for farewells. When the Lieutenant Governor is attending a function, parking is required to be reserved in front of the building where an event is being held.